The first actual SLS flight hardware has been assembled, leaping from engineering blueprints on computer screens to individual metallic components that technicians are feeding into NASA’s gigantic “Welding Wonder” machine at the agency’s Michoud Assembly Facility in New Orleans. Technicians are bending metal and have now finished welding together the pieces of flight hardware forming the first major SLS flight component – namely the engine section that sits at the base of the SLS core stage. The engine section of the core stage will house the four RS-25 engines that will power the maiden launch of SLS and NASA’s Orion deep space manned spacecraft in late 2018. The core stage towers over 212 feet (64.6 meters) tall, sports a diameter of 27.6 feet (8.4 m) and stores the cryogenic liquid hydrogen and liquid oxygen that feeds and fuels the boosters RS-25 engines. SLS will be the most powerful rocket the world has ever seen. It will propel astronauts in the Orion capsule on deep space missions, first back to the Moon by around 2021, then to an asteroid around 2025 and then beyond to the Red Planet in the 2030s – NASA’s overriding and agency wide goal. The SLS core stage welding work is carried out in the massive 170-foot-tall Vertical Assembly Center (VAC) at Michoud. Boeing is the prime contractor for the SLS core stage. On Sept. 12, 2014, NASA Administrator Charles Bolden officially unveiled VAC as the world’s largest welder at Michoud. “This rocket is a game changer in terms of deep space exploration and will launch NASA astronauts to investigate asteroids and explore the surface of Mars while opening new possibilities for science missions, as well,” said NASA Administrator Charles Bolden during the ribbon-cutting ceremony at Michoud. For SLS they will be operating at 109% of power, compared to a routine usage of 104.5% during the shuttle era. They measure 14 feet tall and 8 feet in diameter. The SLS weld team has been busy. Technicians have already assembled a qualification version of the engine section on the Vertical Assembly Center at Michoud. Later this year it will be shipped to NASA’s Marshall Space Flight Center in Huntsville, Alabama, to undergo structural loads testing. In March, they also completed welding of a liquid oxygen tank confidence article on the Vertical Assembly Center. And in February they welded the liquid hydrogen tank confidence article. The SLS core stage is comprised of five major structures: the forward skirt, the liquid oxygen tank, the intertank, the liquid hydrogen tank and the engine section. The tanks are assembled by joining previously manufactured domes, rings and barrels components together in the Vertical Assembly Center by a process known as friction stir welding. The rings connect and provide stiffness between the domes and barrels. The SLS core stage builds on heritage from NASA’s Space Shuttle Program and is based on the shuttle’s External Tank (ET). All 135 ET flight units were built at Michoud during the thirty year long shuttle program. According to the current schedule, NASA plans to finish all welding for the core stage — including confidence, qualification and flight hardware — of the SLS-1 rocket sometime this summer. Engineers are constructing the confidence and qualification hardware units to verify that the welding equipment and procedures work exactly as planned. “The confidence will also be used in developing the application process for the thermal protection system, which is the insulation foam that gives the tank its orange color,” say NASA officials. Altogether , the SLS first stage propulsion comprises the four RS-25 space shuttle main engines and a pair of enhanced five segment solid rocket boosters (SRBs) also derived from the shuttles four segment boosters. The maiden test flight of the SLS/Orion is targeted for no later than November 2018 and will be configured in its initial 70-metric-ton (77-ton) version with a liftoff thrust of 8.4 million pounds. Meanwhile the welded skeletal backbone for the Orion EM-1 mission recently arrived at the Kennedy Space Center on Feb. 1 for outfitting with all the systems and subsystems necessary for flight. The Obama Administration has announced its new Federal budget and is proposing to cut NASA’s Fiscal Year 2017 Budget to $19 billion by carving away significant funding for deep space exploration, whereas the overall US Federal budget actually increases to over $4.1 trillion. This 2017 budget request amounts to almost $300 million less than the recently enacted NASA budget for 2016 and specifically stipulates deep funding cuts for deep space exploration programs involving both humans and robots, during President Obama’s final year in office. The 2017 budget proposal would slash funding to the very programs designed to expand the frontiers of human knowledge and aimed at propelling humans outward to the Red Planet and robots to a Jovian moon that might be conducive to the formation of life. Absent sufficient and reliable funding to keep NASA’s exploration endeavors on track, further launch delays are almost certainly inevitable – thereby fraying American leadership in space and science. 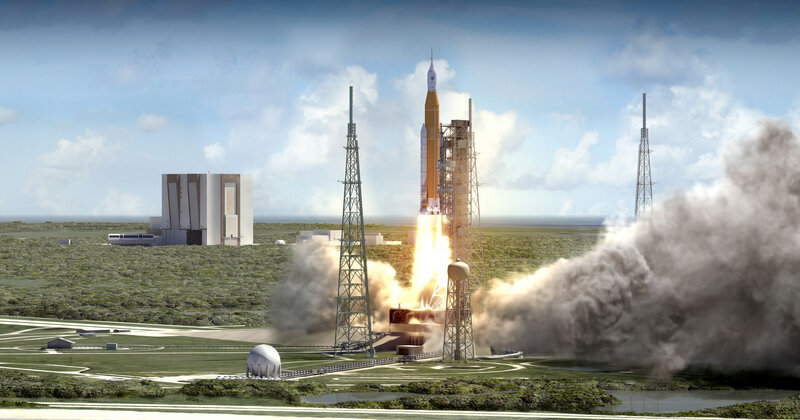 The administration is specifying big funding cuts to the ongoing development of NASA’s mammoth Space Launch System (SLS) heavy lift rocket and the state of the art Orion deep space crew capsule. They are the essential first ingredients to carry out NASA’s ambitious plans to send astronauts on deep space ‘Journey to Mars’ expeditions during the 2030s. The overall Exploration Systems Development account for human deep space missions would be slashed about 18 percent from the 2016 funding level; from $4.0 Billion to only $3.3 Billion, or nearly $700 million. SLS alone is reduced the most by $700 million from $2.0 billion to $1,31 billion, or a whopping 35 percent loss. Orion is reduced from $1.27 billion to $1.12 billion for a loss of some $150 million. Make no mistake. These programs are already starved for funding and the Obama administration tried to force similar cuts to these programs in 2016, until Congress intervened. Likewise, the Obama administration is proposing a draconian cut to the proposed robotic mission to Jupiter’s moon Europa that would surely delay the launch by at least another half a decade or more – to the late 2020s. The Europa mission budget proposal is cut to only $49 million and the launch is postponed until the late 2020s. The mission received $175 million in funding in 2016 – amounting to a 72 percent reduction. Furthermore there is no funding for a proposed lander and the launch vehicle changes from SLS to a far less powerful EELV – causing a year’s long increased travel time. In order to maintain an SLS launch in approximately 2022, NASA would require a budget of about $150 million in 2017, said David Radzanowski, NASA’s chief financial officer, during a Feb. 9 teleconference with reporters. Why is Europa worth exploring? Because Europa likely possesses a subsurface ocean of water and is a prime target in the search for life! Overall, NASA’s hugely successful Planetary Sciences division suffers a huge and nearly 10 percent cut of $141 million to $1.51 billion – despite undeniably groundbreaking scientific successes this past year at Pluto, Ceres, Mars and more! Altogether NASA would receive $19.025 billion in FY 2017. This totals $260 million less than the $19.285 billion appropriated in FY 2016, and thus corresponds to a reduction of 1.5 percent. By contrast, the overall US Federal Budget will increase nearly 5 percent to approximately $4.1 trillion. Simple math demonstrates that NASA is clearly not a high priority for the administration. NASA’s share of the Federal budget comes in at less than half a cent on the dollar. NASA’s Fiscal Year 2017 budget proposal was announced by NASA Administrator Charles Bolden during a televised ‘State of NASA’ address at the agency’s Langley Research Center in Virginia on Feb. 9. Bolden did not dwell at all on the significant funding reductions for exploration. And he outlined some milestones ahead. “We’ll continue to make great progress on the Space Launch System – SLS–rocket and we’re preparing for a second series of engine tests,” said Bolden. NASA plans to launch the first combined SLS/Orion on the uncrewed Exploration Mission-1 (EM-1) in November 2018. Indeed the Orion EM-1 pressure vessel just arrived at the Kennedy Space Center last week to completely install all the systems required for flight. The launch date for the first crewed flight on EM-2 was targeted for 2021. But EM-2 is likely to slip to the right to 2023, due to insufficient funding. Lack of funding will also force NASA to delay development of the far more capable and powerful Exploration Upper Stage (EUS) to propel Orion on deep space missions. It will now not be available for the SLS/EM-2 launch as hoped. The proposed huge budget cuts to SLS, Orion and Europa are certain to arose the ire of multiple members of Congress and space interest groups, who just successfully fought to increase NASA’s FY 2016 budget for these same programs in the recently passed 2016 omnibus spending bill. “This administration cannot continue to tout plans to send astronauts to Mars while strangling the programs that will take us there,” said Rep. Lamar Smith (R-Texas), Chairman of the House Science, Space, and Technology Committee, in a statement in response to the president’s budget proposal. “The Coalition for Deep Space Exploration … had hoped the request would reflect the priorities laid out for NASA in the FY16 Omnibus, for which there was broad support,” said Mary Lynne Dittmar, executive director of the Coalition for Deep Space Exploration, in a statement. Funding for the James Webb Space Telescope (JWST) was maintained at planned levels to keep it on track for launch in 2018. On Dec. 18, 2015, the US Congress passed and the president signed the 2016 omnibus spending bill which funds the US government through the remainder of the 2016 Fiscal Year. As part of the omnibus bill, NASA’s approved budget amounted to nearly $19.3 Billion. That was an outstanding result and a remarkable turnaround to some long awaited good news from the decidedly negative outlook earlier in 2015. The 2016 budget represented an increase of some $750 million above the Obama Administration’s proposed NASA budget allocation of $18.5 Billion for Fiscal Year 2016, and an increase of more than $1.2 Billion over the enacted budget for FY 2015. Under the proposed NASA budget for Fiscal Year 2017, the fictional exploits of ‘The Martian’ will never become reality. And the hunt for extraterrestrial life on the icy moons of the outer solar system is postponed yet again. 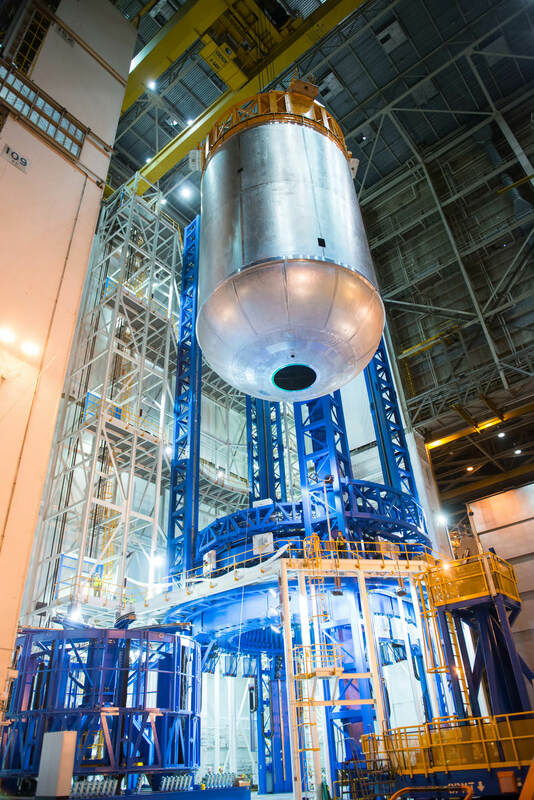 In a major step towards flight, engineers at NASA’s Michoud Assembly Facility in New Orleans have finished welding together the pressure vessel for the first Lunar Orion crew module that will blastoff in 2018 atop the agency’s Space Launch System (SLS) rocket. This Orion is going to the Moon and back. In the wake of NASA’s supremely successful inaugural test flight of the Orion deep space capsule on the EFT-1 mission in Dec. 2014, NASA is beefing up the critical thermal protection system (TPS) that will protect astronauts from the searing heats experienced during reentry as the human rated vehicle plunges through the Earth’s atmosphere after returning from ambitious expeditions to the Moon and beyond. Based in part on lessons learned from EFT-1, engineers are refining Orion’s heat shield to enhance the design, ease manufacturing procedures and significantly strengthen is heat resistant capabilities for the far more challenging space environments and missions that lie ahead later this decade and planned further out in the future as part of NASA’s agency-wide ‘Journey to Mars’ initiative to send humans to the Red Planet in the 2030s. NASA took another big step on the path to propel our astronauts back to deep space and ultimately on to Mars with the long awaited decision to formally restart production of the venerable RS-25 engine that will power the first stage of the agency’s mammoth Space Launch System (SLS) heavy lift rocket, currently under development. Aerojet Rocketdyne was awarded a NASA contract to reopen the production lines for the RS-25 powerplant and develop and manufacture a certified engine for use in NASA’s SLS rocket. The contract spans from November 2015 through Sept. 30, 2024. The core stage (first stage) of the SLS will initially be powered by four existing RS-25 engines, recycled and upgraded from the shuttle era, and a pair of five-segment solid rocket boosters that will generate a combined 8.4 million pounds of liftoff thrust, making it the world’s most powerful rocket ever. The newly awarded RS-25 engine contract to Sacramento, California based Aerojet Rocketdyne is valued at 1.16 Billion and aims to “modernize the space shuttle heritage engine to make it more affordable and expendable for SLS,” NASA announced on Nov. 23. NASA can also procure up to six new flight worthy engines for later launches. “SLS is America’s next generation heavy lift system,” said Julie Van Kleeck, vice president of Advanced Space & Launch Programs at Aerojet Rocketdyne, in a statement. The lead time is approximately 5 or 6 years to build and certify the first new RS-25 engine, Van Kleek told Universe Today in an interview. Therefore NASA needed to award the contract to Aerojet Rocketdyne now so that its ready when needed. The RS-25 is actually an upgraded version of former space shuttle main engines (SSMEs) originally built by Aerojet Rocketdyne. The reusable engines were used with a 100% success rate during NASA’s three decade-long Space Shuttle program to propel the now retired shuttle orbiters to low Earth orbit. Those same engines are now being modified for use by the SLS on missions to deep space starting in 2018. But NASA only has an inventory of 16 of the RS-25 engines, which is sufficient for a maximum of the first four SLS launches only. Although they were reused numerous times during the shuttle era, they will be discarded after each SLS launch. And since the engines cannot be recovered and reused as during the shuttle era, a brand new set of RS-25s will have to be manufactured from scratch. Therefore, the engine manufacturing process can and will be modernized and significantly streamlined – using fewer part and welds – to cut costs and improve performance. “The new engines will incorporate simplified, yet highly reliable, designs to reduce manufacturing time and cost. For example, the overall engine is expected to simplify key components with dramatically reduced part count and number of welds. At the same time, the engine is being certified to a higher operational thrust level,” says Aerojet Rocketdyne. The existing stock of 16 RS-25s are being upgraded for use in SLS and also being run through a grueling series of full duration hot fire test firings to certify them for flight, as I reported previously here at Universe Today. Among the RS-25 upgrades is a new engine controller specific to SLS. The engine controller functions as the “brain” of the engine, which checks engine status, maintains communication between the vehicle and the engine and relays commands back and forth. Each of the RS-25’s engines generates some 500,000 pounds of thrust. They are fueled by cryogenic liquid hydrogen and liquid oxygen. For SLS they will be operating at 109% of power, compared to a routine usage of 104.5% during the shuttle era. They measure 14 feet tall and 8 feet in diameter.